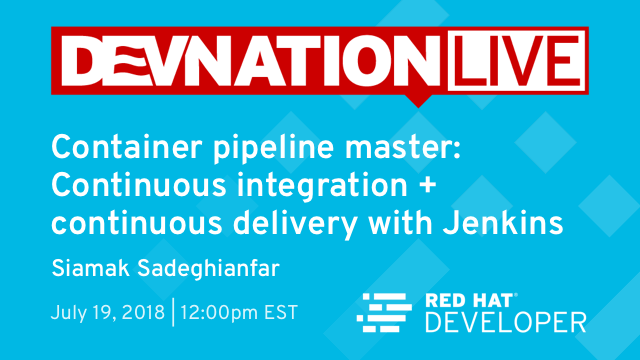 Join us for the next online DevNation Live on Thursday, July 19th at 12pm EDT for Container pipeline master: Continuous integration + continuous delivery with Jenkins, presented by Red Hat principal technical product marketing manager for Red Hat OpenShift, Siamak Sadeghianfar. In this session, we’ll take a detailed look into how you can build a super slick, automated continuous integration and continuous delivery (CI/CD) Jenkins pipeline that delivers your application payloads onto the enterprise Kubernetes platform, Red Hat OpenShift. You see how zero-downtime deployment patterns can be part of your release process when you are using a container platform based on Kubernetes. Automating your build, test, and deployment processes can improve reliability and reduce the need for rollbacks. However, we’ll show you how rollbacks can be handled too. Register now and join the live presentation at 12pm EDT, Thursday, July 19th. How to build a continuous integration and continuous delivery (CI/CD) pipeline using Jenkins on a container platform. Why Red Hat OpenShift (the enterprise Kubernetes platform) makes it easy for even small teams to build sophisticated deployment pipelines. How zero downtime deployments and rollbacks can be achieved using a container platform. Siamak Sadeghianfar (@siamaks) is a Red Hat principal technical product marketing manager for Red Hat OpenShift. Siamak strives to educate IT professionals, customers, and partners on all aspects of application development with containers, and how new technologies can be used to solve business problems quicker and with less friction. A developer at heart, he is passionate about the application development life cycle, processes, and architecture. Siamak has more than 15 years of experience in the IT industry. Don’t forget to register now and join the live presentation at 12pm EDT, Thursday, July 19th.